In my previous post, about the Riding Lights Christmas shows, I promised a little something extra for those among you who don't want to get into the Christmas spirit until the last possible minute. Which bring me nicely onto Riding Lights Senior Youth Theatre, and their new production of Inherit the Earth. Way before Kony 2012 and its embarrassing fallout, a group of actors at the Riding Lights Summer Theatre School came together to device a play about child soldiers in the Lord's Resistance Army in Uganda. It depicts the lives of a group of children forcibly recruited into Joseph Kony's army, being promised a better future but ending up being asked to kill or be killed. Much like Clockheart Boy, I was lucky enough to see Inherit the Earth at its very first performance in 2004 (I was at the same Summer School, playing Macduff in Macbeth). It's a very intense experience, with a number of really strong characters and a story that pulls no punches. But every bit as importantly, it approaches religious themes (in this case how Christian beliefs are manipulated for political gain) to encourage a discussion of the role of faith in modern life: it asks questions but gives no easy answers. 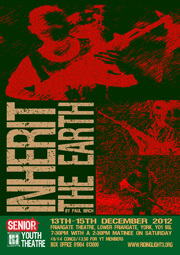 Inherit the Earth is playing at the Friargate Theatre in York from December 13th-15th. You can find all the details about performance times and ticketing here. If you want more information on the Riding Lights Summer Theatre School (which I did four times between 2003 and 2006), click here. Oh, and one last thing - one of the people I acted with at that summer school, Emma Bagnall, is serving as Assistant Director on this production. So if you want to get a good idea of her talents before we goes touring with Roughshod, here's your chance.